I was just leaving school when the war started, and I went to work with my father on the highways. That's how I joined the civil defence squad. If my Dad hadn't have been a member, they wouldn't have let me join because I was only 14. The group of rescuers I joined was sent to Barton Hall for two weeks intensive training. They taught us about tunnelling, first aid, how to shore up buildings and how to get into buildings without a ladder. This training came not a minute too soon. Almost as soon as the group returned back to Bath, their new skills would be called into action. We had a call from the Combe Down depot and the supervisor told us a raid was about to happen. We opened the back door of the house and the German planes were machine-gunning the green behind our house. We had to get the squad's lorry out to collect most of the other men in the squad. As we were driving along, past the old Fuller's Earth works, the wheels of the lorry became entangled with telephone wires which had been knocked down by the raid. While it was sorted out, my dad told me to run on ahead to warn the men at Dunkerton about the raid. By now, father and son could hear the threatening drone of the bombers as they approached Bath. The whole squad by now was ready for action, waiting for instruction at the Midland Road depot. 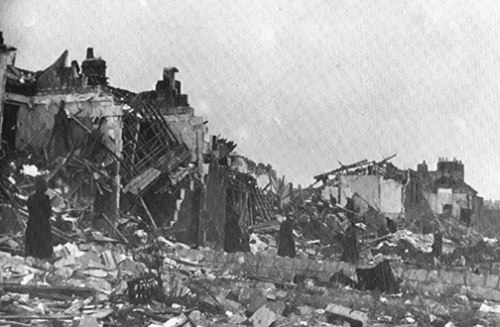 We were sent along to Ivy Terrace, where a terrace of houses had been hit. Most of the residents had got out safely and were in the air raid shelter, but we understood that one old man was trapped. As the smallest and thinnest, I was sent into the house, slipping in between the fallen timbers. I had to cut beneath a beam which had trapped him by the legs, and hold him up until the rest of the men helped rescue him. Just after we had got this man out and away on the back of an ambulance, the second siren went off. I remember we didn't need any lamps to help us work because a gas mains had been cut and was ablaze. We worried about standing next to the light which was acting like a target, but we didn't know where to hide. We decided to split up but we couldn't find the air raid shelter on Roseberry Road because a blast had blown the sign away. We found shelter in Barter's coal yard instead. Eventually the raid finished and we walked back along the road. Our lorry had been severely damaged, and then we heard shouts for help. We found a lorry and loaded the wounded onto the back. There wasn't time to wait for ambulances. I'll never forget the dreadful moaning and groaning as we drove along the road, but there was nothing else we could do to make their journey more comfortable. It was like an automatic pilot. I couldn't stop thinking about how close my father and I were to death or worrying about my mother and my sister up in Odd Down. During that 24 hours or so, my childhood ended. Douglas and his father returned to the Midland Road depot, to be greeted by looks of astonishment on the supervisor's face. He said, 'I'm seeing a ghost!' He had just written in the log book that the Somerset County Council Rescue Squad was believed to have been wiped out. Without today's modern communication systems, it was impossible to find out whether any of the other men had been injured, but one by one, they returned to the depot. 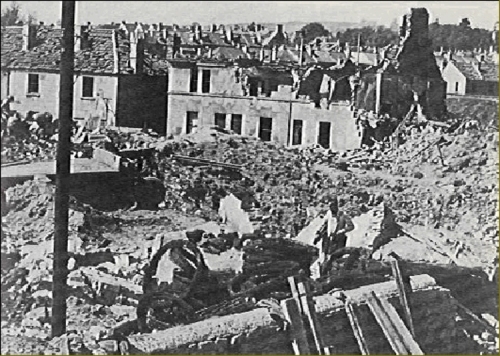 As dawn broke, it became clear the devastation the raid had wrought on Bath and, eventually after 36 hours without sleep, Douglas and his father were told to go home to rest. The next day we were asked to go to the Regina Hotel, opposite the Assembly Rooms. It had been badly hit and was in a dangerous condition. Again, because I was the smallest and thinnest, I had to try to find out if anybody was still alive in there. I managed to get to the end of the tunnel and found 26 people there, all dead. The picture on the right shows what was left of the Regina Hotel. The part that was destroyed by the bomb was about the same size as the part that remained standing. 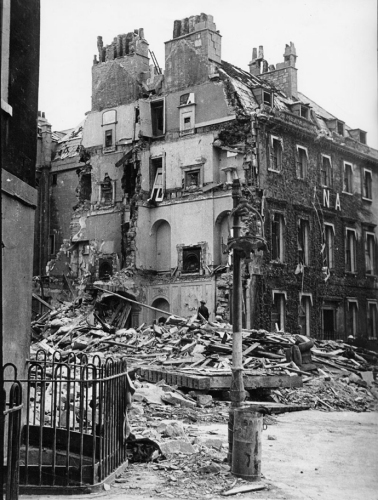 The Regina Hotel had reinforced its basement to use as an air raid shelter, but a number of guests had decided to remain in their rooms rather than go down into the cellars, which accounts for the high number of deaths. 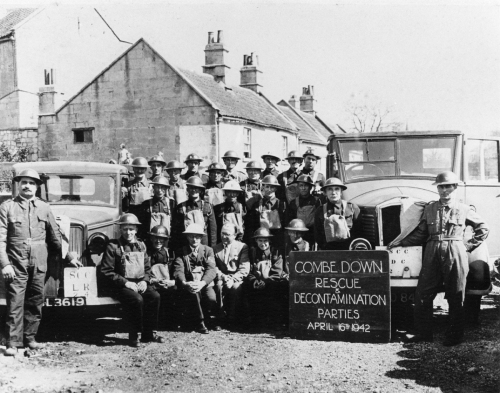 The Combe Down Rescue and Decontamination Parties that are shown in the first photograph are the group that Douglas and his father belonged to. It is not known whether they are in the photograph though. The old Fuller's Earth works was on the south side of Bath, just outside the city boundary on the road to Radstock. Fuller's earth was a naturally occurring clay that was used in the woollen industry for degreasing newly shorn wool. It was also made into an ointment called "Fullers Earth Cream". There was no address of Ivy Terrace, so either Douglas has remembered the address wrong, or it was known locally by a name that was not its postal address. The burst gas main that was ablaze, which is mentioned in a later paragraph was in Brook Road near the junction with Lower Bristol Road and not far from Roseberry Road, so it is in that area that the rescue took place. The most likely address is Elm Grove Terrace, which was a terrace of 18 houses off Brook Road, and parallel with the Lower Bristol Road. As the pictures show, this terrace was very badly damaged. Barter's coal yard was on the Lower Bristol Road, opposite Vernon Park, and roughly where the new Bath Spa University Student Accommodation block has recently been built.